Corporations are far more interested in buying their own renewables than they were even one year ago. Cheaper renewable energy is allowing more corporations to look at options for generating their own power. 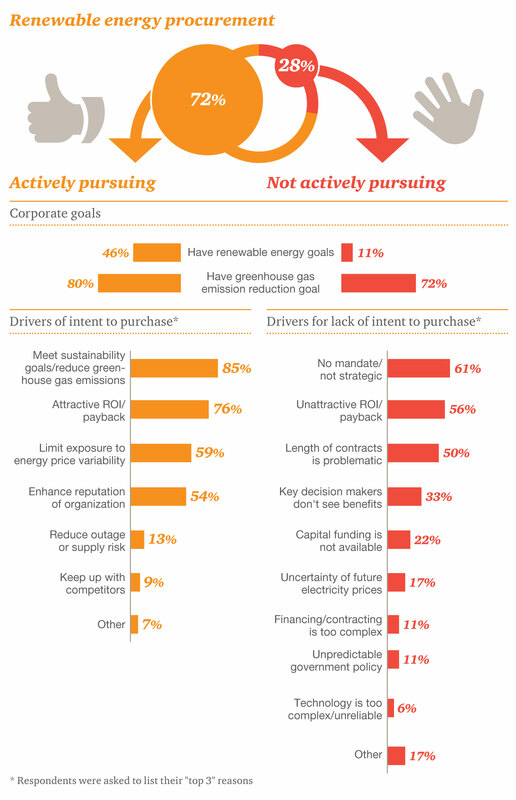 But corporate sustainability mandates, rather than price alone, remain the primary driver of those purchasing decisions, according to a new survey from PwC. Seventy-two percent of companies surveyed said they are actively procuring renewable energy, mainly wind and solar. For those that are buying renewables, nearly half have specific renewable energy goals, although the attractive payback was the second-biggest driver for seeking out clean energy. In the past six months, nearly two-thirds of corporations surveyed said they have become more interested in purchasing renewable electricity. This poses a growing challenge for utilities — if they are not the ones providing those energy services. MGM Grand, for example, recently filed to leave Nevada Power to procure its own energy on the wholesale market. Two-thirds of the respondents said they spend more than $100 million per year on energy, making them valuable customers for utilities. Even though many of these corporations have dedicated sustainability and energy managers, they’re not completely striking out on their own. PwC found that they’re looking for help tracking the return on investment of renewable energy projects. They’re also looking for help building the business case for future projects and proving that the projects otherwise would not have been built without their support. There is no lack of competition in providing these services. In the past six months, more than 10 energy service providers have reorganized or expanded their C&I energy management services, according to a new report from GTM Research, The New C&I Energy Management Landscape. For those who can successfully navigate the waters of renewable energy procurement once, they’re likely to do it again. PwC found 85 percent of those who have purchased renewable energy plan to buy more in the next 12 to 18 months. Along with wind and solar, corporations said they are most interested in advanced metering and energy management software, while nearly 60 percent are interested in energy storage. GTM Research estimates the market for integrated C&I energy management, from procurement to energy efficiency, will be valued at $16 billion in 2016.